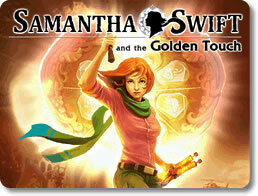 Samantha Swift and the Golden Touch Game Review - Download and Play Free Version! Good music and sound effects. A bit too easy to the experienced hidden objects player. Primarily object hunting with limited adventure elements. Join Samantha Swift For Yet Another Adventure! The story begins with the young explorer, Samantha Swift, hot on the trail of Alexander the Great's Scroll of Wealth, rumored to list his most prized golden treasures. While searching for this ancient treasure she stumbles upon a clue about her missing father and unwittingly gives a nefarious villain the means to rediscover the Midas Touch, the ability to turn objects into solid gold. Realizing her mistake, she ventures off to right her terrible wrong and bury the secret to the golden touch once and for all. The search for dad will have to wait as Samantha travels the globe, searches for clues, and collects a variety of artifacts for her Museum of Secrets Lost. Golden Touch primary gameplay consists of hidden object sequences with some puzzle solving mini-games, or some combination of these two genres. You will usually start things off with combing an area for specific items listed at the bottom of the screen. Some of these items are actually tools which you can later use to uncover the hidden items in your lists, denoted by the blue text used for their names. For instance, you might be asked to find a shovel which you then use to dig up a statuette or you'll need to use a broom to whisk away cobwebs concealing a crank. If you find yourself having any trouble though, there are several devices which will aid you in your searching. For starters, there is a hint button which will show you exactly where an item is and you can even get more hints by finding hidden lightning bolts in the various scenes. Then, there is the scanner which will show you the silhouette of the item and even changes color according to how close the cursor is to the item. Golden Touch provides an interesting gameplay experience with its item based hidden object puzzles and variety of puzzles types thrown into the mix, such as shuffling tiles to reveal hidden keys or untying knots in the correct order to unlock a door. Add in a hand-drawn art style, great music, and decent length and you'll find hours of enjoyable gameplay. Find yourself being drawn in by this globe trotting tale of the young explorer Samantha, and her museum assistants, a charming little crew who want to find Sam's dad as much as she does and, also, to preserve antiquities for the sake of history. If you like hidden object games with their share of puzzling mini-games, then download Samantha Swift and the Golden Touch today! Samantha Swift is an adventurer aiming to locate the golden scroll of Alexander, but instead she discovers the mystery of King Midas and seeks to uncover a historical scheme involving the ancient despot. Expect a long adventure filled with many artifacts to be collected, clues to be uncovered, and exciting locations to visit. Travel through the sand-covered ancient worlds of Egypt and Turkey, explore mansions and villages from Ireland to Thailand and everywhere in between. Each location surpasses its predecessor in splendor, displaying vibrant colors and fantastic features such as ancient statues, Turkish baths, and even magnificent palaces! Sounds effects and music also complement the game very well, reinforcing ominous moods in appropriate places and adventurous in others. The plot itself is somewhat invigorating, become more deeply involved in the modern plot to capture the power of the Midas touch while collecting ancient relics along the way, a bonus to the history lover. While it technically fits into both the adventure and hidden objects categories, expect primarily object hunting with some tasks completed with items found and scattered mini-games. 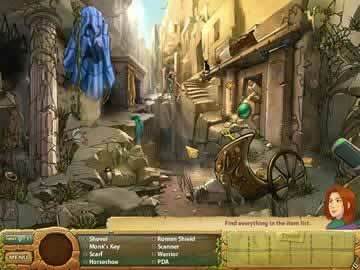 Unlike many hidden objects/adventure games, the length is surprisingly long and will offer many hours collecting items and using them to fulfill missions. Unfortunately, the experienced hidden objects gamer will likely be unpleasantly surprised by the simplicity of object location and will finish the game in record time. That said, more casual or inexperienced players will almost certainly be challenged by the tasks presented in this feature, and therefore is most highly recommended to novice players. Attractive locations, great length and fun-filled story line will make this a hit to those less experienced in the hidden objects/adventure categories. 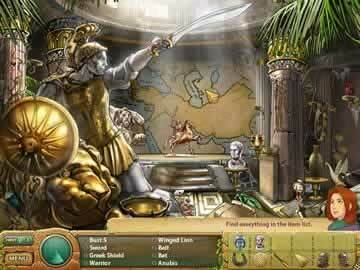 View a few gameplay highlights featuring the hidden object searching, tile shuffling puzzles, and item based puzzles which can be found in Samantha Swift and the Golden Touch.